People need community and privacy. Cohousing is a way for people to live together so that they can have as much community and privacy as they want. The concept is simple and immediately comprehensible. It is the way forward for human beings to live together in a safe, independent and caring neighbourhood. It is a revolution that is beginning now. We will no longer just choose a new house when we move, we will join a new community. 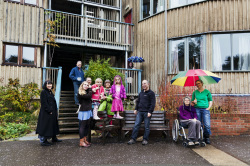 Coflats® Slad Brook is the 3rd Cohousing community in Stroud and the second CoFlats Community (see links for others). Coflats® is partly inspired by the 1930's Isokon Building in Hampstead. In its heyday before the war, it was an innovative and radical community housing project. Like Cohousing there was a shared dining room and laundry. Agatha Christie, Bauhaus designers, poets, artists and philosophers lived there - much like CoFlats®. The community atmosphere enabled the residents to be highly productive. See the article in the Ham and Hi newspaper on CoFlats and re-locating from London. and short video from BBC Radio Gloucestershire and audio (3 mins). Each flat is designed to have 1 bedroom. However, 6 of the flats could have a small 2nd or even 3rd bedroom if parts of the loft areas were enclosed. One of the benefits of Cohousing is that we can live in smaller spaces. The large common house has a guest room and plenty of space for entertaining and parties. So that we do not need to have spare unused space in our own dwelling. Each flat has a large private storage room in the common house. CoFlats® Slad Brook is very urban. It is right in the Town Centre. 2 minutes walk from shops, the High Street, the Farmers' Market and 5 minutes walk to the station with fast trains to London (1.5 hour). Directly opposite, is the wonderful Star Anise cafe, serving organic, mostly vegetarian food. They have a busy diary of events and performances. The building is energy efficient. It re-uses an existing property, less wasteful than demolition and new build. It has high thermal and sound insulation. Heat recovery ventilation is used throughout. This allows incoming fresh air to be heated by the outgoing air. Each flat is rated as EPC grade A. We think grade A may be unprecedented for a retrofit. However, the main energy saving feature is the communal living. Sharing meals can be cheaper and less wasteful. The car share club, the town centre location, bicycle storage and the amazing communal facilities all allow for Coflats® to be a sustainable and caring place to live for many years. It will be state of the art as a community even after EPC grade A is considered not the best practice.